The Sambar Deer (Cervus Unicolor) is another Asian import that outside its natural range is found only in the North Island of New Zealand. Regarded as one of the most cunning of all the deer species, the Sambar is very much in demand as a trophy animal. The Sambar is the largest of the deer species. Bigger than a Red in body size, a typical trophy head will carry a 3×3 (6-point) rack. Typical Sambar habitat is thick scrub and trees, and any hunter who experiences the fog horn-like alarm of a Sambar at close quarters for the first time is going to get the shock of his or her life. Big and cunning, the Sambar makes for a great trophy animal. 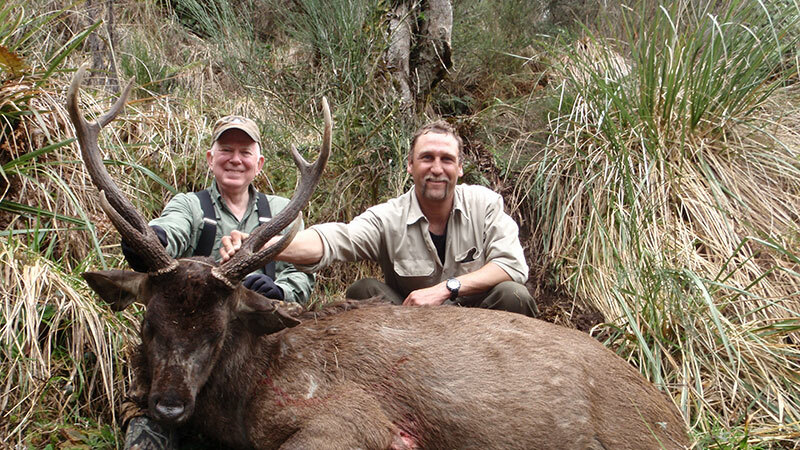 We offer trophy hunting for Sambar on exclusive free range private land and through good management practices, we have some of the largest Sambar available in the South Pacific. Sambar hunting runs April through December and the ‘Rut’ can fluctuate from May/August.